OXFORD, Miss. 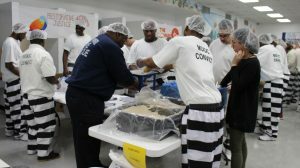 – Students and faculty from the University of Mississippi Department of Legal Studies recently joined forces with the Marshall County Correctional Facility in Holly Springs to pack more than 100,000 meals in one day for an organization that helps needy children. Feed My Starving Children is a Christian nonprofit working to eliminate starvation and hunger worldwide. Linda Keena, interim chair for the Department of Legal Studies, teaches restorative justice and entrepreneurship courses to a group of maximum-security inmates at the facility, where the idea for the project got its start. Over the course of eight hours, the group packed enough meals to feed 277 children every day for an entire year. “Part of what we try to do is find ways to repair harm that their behavior has caused to the community, so we decided we would try to put together this project,” Keena explained. “It has been a really rewarding day. For Keena, this project was a valuable service-learning experience for her criminal justice students. Kornisha Johnson, a senior criminal justice major from Sallis, described the experience as a blessing. “This project has meant a lot to me,” Johnson said. “Back home, there is little opportunity and I’m surrounded by poverty, so to be able to give back to so many children is amazing. Lexi Caviness, a sophomore criminal justice minor from Ripley, said the experience has changed her perspective of the incarcerated. Many of the offenders, including Richard Moore of Walls, expressed gratitude for getting to do something positive in reparation for their past wrongdoings. “We’re all in here for doing something destructive, and society looks at us like we are throwaways,” Moore said. “This gives us an opportunity to show that we have changed and that we are capable of doing something good. The inmates first had to pass the Ice House Entrepreneurship class as a prerequisite to the restorative justice class to participate in the food-packing event, Keena said. Gary Schoeniger, founder and CEO of Entrepreneurial Learning Initiative and co-author of the Ice House Entrepreneurship book, flew in from his headquarters in Ohio for the packing event. Schoeniger and Keena have spoken at venues across the country, sharing the effective use of the Ice House Entrepreneurship program in prison systems. Students in the Department of Legal Studies’ criminal justice program can declare an emphasis in corrections. They are taught the skills they will need to manage prisoners, interact with adult parolees and probationers, and supervise juveniles in the community or secured juvenile facilities. Students learn how courts and prisons work and different strategies for dealing with inmates, probationers and parolees, including rehabilitation efforts and counseling. For more information about programs on study in criminal justice, email legalstu@olemiss.edu or visit http://legalstudies.olemiss.edu/.